Go is such a beautiful game. I marvel at the wonders which present themselves. 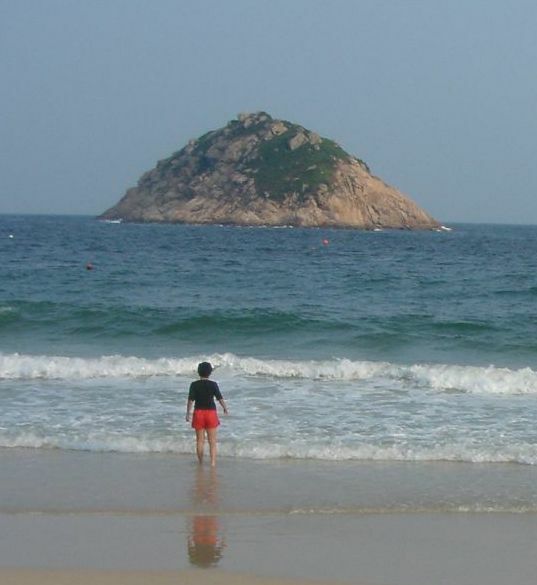 A landscape scene from Shek O Beach in Hong Kong which reminds me of a go stone. I have recently learned the most basic fundamentals of Baduk. I then printed number 7 in the super book series from the AGA website. It appears I need some intermediate learning first. Do you have any recommendation for a good English language book that is above the level of basic rules and principles but not as advanced as super book number 7? I am looking for the best one-volume, intermediate book in English. It seems some of the English “series” are padded, in the sense that the amount of material included in five books could easily be presented in a single book. I’d would recommend “The Second Book of Go” as a good intermediate book in English for someone who has learned the basic rules and principles. And I would also recommend doing a lot of go problems so you can start understanding the tactics which are useful in go. You can also try checking out the posts on the go forum at Lifein19x19 where many English speaking go enthusiasts share their thoughts and ideas. Your Blog is simply excellent! Great work! thank you once again for the access!! Keep up the good work! Love reading the articles in your blog. Congrats on the blog, it’s really great. I want to ask you about a really old book that I found in my country (Argentina), maybe you can contact me via PM? If it’s a go book, why don’t you post a picture of it on the L19 forum? I’m sure I wouldn’t be the only go enthusiast that would enjoy helping you learn more about your book. And there may be other knowledgable people who could tell you more as well. Beautiful! Thanks so much for this blog.